News that former NHL enforcer Todd Ewen's recent death was ruled a suicide saddened me. There is no doubt in my mind that competitive sports exact a physical and mental toll on professional athletes -- deaths are not just the consequences of a violent game and the long-term nefarious effects of injuries incurred on these athlete's bodies and brains, but a reflection of a society that does not allow for its men to be weak. Middle aged man depressed/suicidal/loosing his mind/upset. I don't claim to be a hockey fanatic, but it's hard to live in this town and not have the game be part of your life. News that former NHL enforcer Todd Ewen's recent death was ruled a suicide saddened me. Dying at the age of 49 is way too young, particularly at your own hands. I remember only a few years ago writing about retired NHL player Wade Belak having been found dead from a suicide and thinking to myself, "Another one? This isn't normal." Belak had been the third player to die within a few-month span in 2011 from unnatural causes. He joined Derek Boogaard, who died that summer after mixing alcohol and painkillers, and Rick Rypien, who hung himself. Add to that list John Kordic and Steve Montador, the latter found dead at the age of 35. By all reports, Montador was suffering from chronic traumatic encephalopathy (CTE), a degenerative brain condition that doctors have noted is caused by concussions and repetitive brain trauma. You can't deny there's a problem somewhere. The sports world seems to slowly be waking up to the fact that concussions and repetitive brain trauma exact a real toll on an athlete's physiology, and sometimes can alter (irrevocably in most cases) who that person is. Long-term effects are thought to include changes in mood, such as depression, suicidal tendencies, apathy, anxiety, memory loss and behavioural issues, such as a short fuse, aggression and, in some cases, difficulty with balance and gait. There is no doubt in my mind that competitive sports -- particularly a sport like ice hockey that not only allows for fighting, but seems to revel in it -- exact a physical and mental toll on professional athletes. But I suspect so much more is at play. These deaths are not just the consequences of a violent game and the long-term nefarious effects of injuries incurred on these athlete's bodies and brains, but a reflection of a society that does not allow for its men to be weak. These deaths are partly attributable to the extreme contradiction that exists between what is expected of these men (making a living in a sport that glorifies violence and alpha-male behaviour) and what they are expected to keep buried inside. When showing weakness and vulnerability is frowned upon in our society, seeking help isn't always easy. It is no surprise to me that a similarly disturbing scenario plays out routinely in the military where far too many vets trained to exhibit mental and physical toughness end up committing suicide at disturbing rates. As a feminist, I find myself constantly challenging gender roles, behaviours and attributes based on whether we were born male or female. Because gender roles are socially constructed, they also inevitably reflect the gender inequality that still permeates our culture. As a result, aggressive and dominant masculinity is praised, while nurturing and expressive femininity are not nearly as valued. Boys aren't supposed to cry, they're supposed to "man up." If as a young boy you're raised to conform to these roles, you will find yourself emotionally stifled as an adult male, unable to express any softness or emotion. As a result, sexism ends up adversely affecting both sexes, as it places unreasonable expectations on their behavior based on nothing but their gender. While the stigma associated with therapy and seeking help for mental health issues and depression may no longer be as strong, it still persists in a society that values self-reliance and emotional strength. Seeking help is too often seen as tantamount to admitting defeat, and this world just doesn't like "quitters." That stigma can be even more insurmountable for men who are supposed to keep a stiff upper lip. In Crossing the No Cry Zone: Psychotherapy with Men, Fredric E. Rabinovitch, Ph.D. states that "because the traditional male role requires men to hide more vulnerable emotions, they often have few outlets for emotional expression. 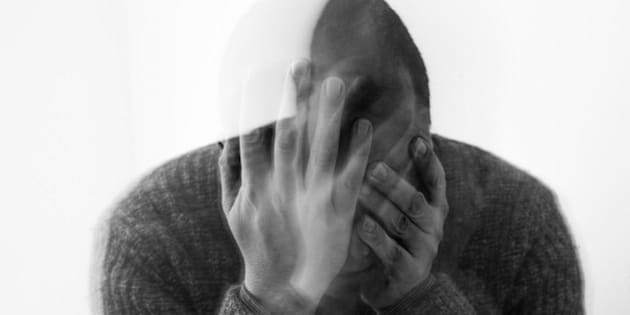 In comparison to women, higher rates of alcoholism, drug addiction, violence and successful suicide suggest that many men act out rather than verbally share their emotional pain." I don't know the inner workings and underlying problems that can lead someone to believe that their situation is hopeless, beyond repair and that suicide is their only option. However, there is no doubt in my mind that the unhealthy and unforgiving attributes and character traits we assign to masculinity as part of separate and very distinct gender roles we're made to take on early in life are doing men no favours. We still live in a society that doesn't make it acceptable for men to be vulnerable, to reach out for help, to admit that "I can't do this alone." Add to that living in a world that's hell bent on idolizing its sports heroes and putting them on pedestals -- there's simply no room to be human. Sports writers and sports commentators have no problems speculating about the extent and seriousness of any physical injuries, but mental issues and depression are still taboo, still hush-hush, still rarely discussed in the open. There are in-depth studies that need to continue to take place on the effects of a violent game and repeated brain trauma on these former players' bodies. But I strongly believe the approach must be two-fold and we must also address the undeniable fact that we live in a world that doesn't encourage our boys (and eventually our men) to show sensitivity and fragility. It's high time for us all to redefine masculinity. Men need to understand that being strong means sometimes having the strength to admit powerlessness. They owe it to themselves and to the people who love them to sometimes be that "weak." If you're experiencing problems, the Canadian Association for Suicide Prevention offers valuable advice and resources. Reach out.